Saturday, January 26th 2019. «Yellow vests» protests were being organized in the main cities of France. Mobilization was not weakening. Support from the population had decreased slightly but was still huge (60%-70%, according to polls). The main slogan has remained the same since November 17, 2018: «Macron must resign». In December, another slogan was added: «Citizens’ initiative referendum«. The government and French President Emmanuel Macron have been doing everything they can to crush the movement. They have tried insults, defamation and have said the demonstrators were both «seditious people» wishing to overthrow the institutions and fascist «brown shirts«. On December 31, Macron described them, as «hateful crowds«. The presence of some anti-Semites led a government spokesman (incorrectly) to describe the entire movement as «anti-Semitic«. Macron called for a «great national debate» to address the problems facing the country. It soon became clear, however, that the «great debate» would be unconventional, to say the least. Macron wrote a letter to all French citizens inviting them to «participate», but saying explicitly that the «debate» would not change anything, that the government would continue in exactly the same direction («I have not forgotten that I was elected on a project, on major orientations to which I remain faithful.»), and that everything that was done by the government since June 2017 would remain unchanged («We will not go back on the measures we have taken»). He then entrusted organizing the «debate» and drafting its conclusions to two members of the government, and requested that «registers of grievances» be made available to the public in all town halls. Macron then launched the «debate» by meeting mayors of many cities, but not in public. He seems to have been concerned that if he organized meetings open to the public, he would be immediately chased away by crowds. Several commentators stressed that pretending to «debate» is nonsense, and that entrusting the organization of the «debate» and the drafting of its conclusions to members of the government, and the way the meetings were organized, clearly show that these performances are a sham. Some commentators pointed out that the term «register of grievances» has not been used since the time of absolute monarchy, that mayors are treated as waxworks and that placing the cities Macron visits in a state of siege is unworthyof a democracy. The French economy is, in fact, sclerotic. The Index of Economic Freedom created by the Heritage Foundation and the Wall Street Journal ranks it 71st in the world (35th among the 44 countries in the Europe region) and notes that «the government spending accounts for more than half of total domestic output». The Index also reveals that «the budget has been chronically in deficit»; that «corruption remains a problem and that «the labor market is burdened with rigid regulations» leading to a high level of unemployment. Guilluy, a geographer, published two books: La France périphérique («Peripheral France») in 2014, and, just weeks before the outbreak of the uprising, No society. La fin de la classe moyenne occidentale («No Society. The End of the Western Middle Class»). In them, he explains that French population today is divided into three groups. The first group is a ruling upper class, totally integrated into globalization, made up of technocrats, politicians, senior civil servants, executives working for multinational companies, and journalists working for the mainstream media. The members of this class live in Paris and the main cities of France. The second group lives in the suburbs of the main cities and in no-go zones («Zones Urbaines Sensibles«). It consists mainly of immigrants. The French upper class, who rule, recruit people to serve it directly or indirectly. They are poorly paid, but highly subsidized by the government, and increasingly live according to their own cultures and standards. The third group is extremely large: it is the rest of the population. It is this group that is called «peripheral France.» Its members are made up of low-ranking civil servants, blue collar workers and former blue-collar workers, employees in general, craftsmen, small entrepreneurs, shopkeepers, farmers, and the unemployed. Members of «peripheral France» have been driven out of the suburbs by the influx of immigrants and the emergence of no-go zones. These «peripherals», for the most part, live 30 kilometers or more from the big cities. They can see that the upper class dismisses them. They often have a hard time making ends meet. They pay taxes but can see that a growing portion is being used to subsidize the very people who drove them out of their suburban homes. When Macron lowered the taxes of the wealthiest, but increased the taxes of the «peripherals» with a fuel tax, it was seen as the last straw — in addition to his arrogant condescension. In a recent interview on the British web magazine Spiked, Guilluy said that the «yellow vests» movement is a desperate awakening of «peripheral France». He predicted that despite Macron’s efforts to displace the problem, the awakening will last, and that either Macron «will recognize the existence of these people, or he will have to opt for a soft totalitarianism». «He must make decisions and he can no longer take any decision without making things much worse… Macron should agree to resign, but will not do it, and would prefer to go to the end, and hit a wall… The next three years will be hell for the yellow vests and for the French». At the end of the protests in Paris on January 26, thousands of «yellow vests» had planned to gather peacefully on one of the main squares of the city, the Place de la République, for a «debate» and to provide responses to the «debate» organized by Macron. The police were ordered to disperse them brutally; they once again used rubber ball launchers and Sting-Ball grenades to do just that. 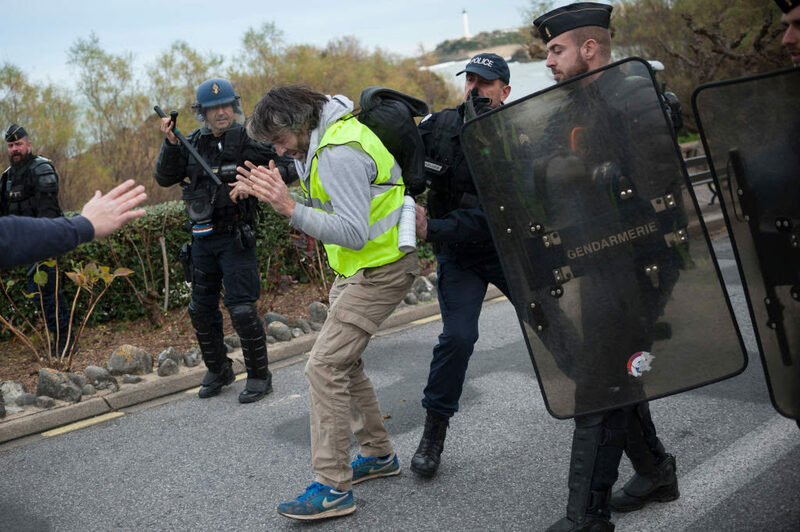 One of the leaders of the «yellow vests» movement, Jerome Rodrigues, was shot in the face while filming police officers in a square nearby, the Place de la Bastille. He lost an eye and for several days was hospitalized. Other protestors were wounded. In an article describing the events of January 26, columnist Ivan Rioufol wrote in Le Figaro: «Repression seems to be the only argument of the caste in power, faced with a large-scale protest that will not weaken». «In 2005, the police were clearly the target of rioters, and they showed restraint in the use of force to bring down the violence. Today, most of those who protest do not attack the police. But instead of acting to bring down the violence, the police are receiving orders pushing them to be very violent. I do not blame the police. I blame those who give them orders». The next day, Sunday, January 27, a demonstration was organized by Macron’s supporters, who called themselves «the red scarves«. The demonstration was supposed to show that an impressive number of people were still on Macron’s side. Organizers said that ten thousand people came. Videos, however, show that the number seems to have been far lower.